Have You Learned to Number Your Days? If not, here is why you should! A snowball in the sun. A shooting star. A firecracker that expends itself in a momentary flourish of noisy brightness and then fizzles out. Such are comparisons some have drawn to describe the briefness of this earthly life. Our days are "swifter than a weaver's shuttle" (Job 7:6), "swifter than a runner... they pass by like swift ships, like an eagle swooping on its prey" (Job 9:25-26). We are like "a breath that passes away" (Psalm 78:39), a fading flower, a fleeing shadow (Job 14:2). Yes, our lifetime is but a short pilgrimage (I Chronicles 29:15). Then we become like "water spilled on the ground, which cannot be gathered up again" (II Samuel 14:14). The Scriptures contain these and many other such comparisons because God does not want us to forget the fact that we are mortal. Once each year God commands His people to observe for seven days the Feast of Tabernacles (Leviticus 23:33-36) — otherwise known as the Feast of Temporary Dwellings — for the very purpose of portraying that this life is temporary. If there is one thought people just naturally do not want to entertain, it is that they are physical, flesh -and-blood beings who grow older each day. Each day is one day less they have on earth. Most people carryon as though there is no limit to the amount of time they have, as though the "day of reckoning" will never come. On the other hand, there are some who have contemplated the subject at least enough that they spend enormous amounts of time and money in a desperate effort to preserve and prolong this life through rejuvenation treatments, fad diets, super-vitamin concoctions, hormones and the like. But alas, at best such measures only postpone, without avoiding, the inevitable. God our Creator, the One who lives forever, who alone has eternal life to give, wants us to think about this subject often. Even every day. Why? So that we never forget how much we depend upon Him. The more independent and self-reliant a person is, the greater his talents, the better his health and living standard, the less likely he is to be concerned about his relationship with God. When things are going right, human nature feels, who needs God? David recognized this truth. As a warrior he had vanquished many foes, including the giant Goliath. He had plenty of reason to feel physically self-confident. This was no doubt why he asked God to help him realize how mortal he was. "Lord, make me to know my end, and what is the measure of my days," David prayed, "that I may know how frail I am" (Psalm 39:4). Frail? David? Yes, in reality. As we all are. "Indeed, You have made my days as handbreadths" — a handbreadth is no longer than several inches, the distance from one edge of your hand to the other — "and my age is as nothing before You; certainly every man at his best state [when he is feeling the most fit, when he is intellectually at his highest point, when he has talents, looks, fame, fortune, influence, personality, power — everything going for him] is but vapor" (verse 5). You have only to lift the lid from a pot of boiling water to see how long vapor lasts. A cloud of steam billows up in feverish motion. You see it. You hear it. You feel it. You smell it. And suddenly, it's gone. How like this very short human pilgrimage! "For what is your life? It is even a vapor that appears for a little time and then vanishes away" (James 4:14). There is no more appropriate time to consider this subject than during the Feast of Tabernacles — the Feast of Temporary Dwellings — when we actually portray the temporary nature of physical life. During the days of the Feast our pattern of life is temporarily different from what it is the rest of the year. It is a nonpermanent change because we are showing that this life is transitory. If we are to live again after this life, we must receive eternal life as a special gift from God. Today few people realize this. They believe we are already immortal, having immortal souls. But that is not the case at all. In the Millennium, however, everybody worldwide will understand that we are mortal — temporary — and that we need God's gift. That is one of the truths we signify by observing the Feast of Temporary Dwellings. What is this life all about? We know for sure it has a beginning and an end. We are on a pilgrimage between the two points. What for? What is supposed to happen during this pilgrimage? What should we be doing — what should we be accomplishing with the preciously brief space of time allotted to us? Notice the answer as God had it preserved in His Bible for all ages to see. Why have the churches of the world mostly ignored it? "Let us hear the conclusion of the whole matter," Solomon recorded, "Fear God and keep His commandments, for this is the whole duty of man" (Ecclesiastes 12:13). You would do well to read that again, Since this mortal life fast slips away, the wise — yes, the sensible, logical — way to use our time is to prepare for the next life, to get into the right relationship with God so He sees fit to give us eternal life. How logical. And yet how many people hold this as their major goal in life? Let us get the perspective! We know we are not justified or saved by our works. But we definitely are going to be rewarded in the next life according to our works in this life. Of that the Bible leaves no doubt (Matthew 16:27, Revelation 14:13). Now, in your mind's eye, picture yourself at the moment when the rewards are being distributed, when the hours spent in Bible study, prayer, fulfilling Jesus' commission, doing good to others, make a very real difference. As you stand there before Jesus Christ, you receive whatever reward you have qualified for. Imagine, if you can, your feelings at that point. Will you at that time realize that your reward could have been greater — maybe a lot greater? For what that you now devote so much of your time, effort, money and other resources might you at that moment feel like kicking yourself? What is it that captures so much of your attention now that will then seem so pitifully unimportant? There'll be no reward for hours passed watching television while God's Word sits unopened on the desk. No reward for material pursuits and projects — even proper and right ones! — that crowd out spiritual growth. No reward for neglect of opportunities to help others. No reward for doing God's work with a slack hand. And possibly, even, no reward at all, as sobering as that particular thought is! Not that our driving motivation ought to be to get as large a reward as possible for ourselves. Rather, the greater the reward we receive, the greater will be our opportunity to serve and contribute to the increase of God's great government. The prayer of Moses, as recorded in Psalm 90, is especially fitting for consideration at this season, since it begins Book IV of the Psalms, which has to do with the Millennium, and therefore, by extension, the Feast of Tabernacles (see the article "Psalms and Salvation: The Message Most Overlook" in the April Good News). Moses opens this Psalm by lauding the timelessness of the Eternal — He who is God "from everlasting to everlasting" (verses 1-2). By contrast he then directs attention to the brief mortality of sinful, natural man — man lacking the right relationship with God (verses 3-9). "The days of our lives," verse 10 continues, "are seventy years [in general] ; and if by reason of strength they are eighty years [some, because of heredity and other factors, live longer than 70 years], yet their boast [what we have to show for them] is only labor and sorrow; for it is soon cut off, and we flyaway." Unless a person is wise enough to realize the importance of each day and unless he uses the time he is allowed to perfect his relationship with the eternal God. In the latter part of Psalm 90, Moses describes some of the blessings of life once we establish a growing contact with God. It is filled with rejoicing and gladness (verse 14). (What a great way to commence the Millennium — and the Feast!) What is more, the work of one's hands — all that is worthwhile that one labors at, builds and accomplishes in life — has meaning to it. Death will not void it or render it futile. It is established (verse 17). But what is essential to make the difference? Moses tells in verse 12 — it is awareness of our present condition of mortality, our temporary estate: "So teach us [this is something we must learn; it doesn't come naturally] to number our days," Moses prayed to God, "that we may gain a heart of wisdom." That's it! In order to be wise, we must learn to number our days, to frequently take stock of where we are in life. Have we been sidetracked, or are we going in the right direction? Are we bogged down or are we making good speed? Are all the activities we are engaged in really worthwhile in the perspective of eternity? Are there ways we can simplify how we live so we can avoid being slowed down and overwhelmed by a multitude of time-consuming diversions and needless complications that yield nothing of lasting value? Are we as pilgrims headed, unencumbered, traveling light, by the shortest, most direct route possible, to the land promised to us? We know how long we have already traveled on this pilgrimage. But we don't know for sure how long we still have to go. We don't know that we'll get to the 70- or 80-year plateau Moses referred to. All the more reason to get the maximum use out of today! Seek God's Kingdom and His righteousness today, as Jesus taught (Matthew 6:33-34). Each of our life spans can be compared to an hourglass. Not an ordinary one that allows you to see the sand in the top as well as the bottom half. The top half in this hourglass is opaque. You can't see inside. In the bottom half, you can see the sand that has already gone through. And, if you look closely, you can see the trickle of sand actually flowing through the narrow middle part. But you don't know whether there remains in the top half a lot of sand, or whether, before your very eyes, are falling the last precious grains. Just to impress the lesson, find a quiet place where you can spend one or two undisturbed minutes. Take with you a clock that makes an audible ticktock. In the silence that is broken only by the seconds ticking away, think: That is my life I'm listening to, my opportunity to get into harmony with God's will, to qualify for salvation, to determine what I will do for all eternity. 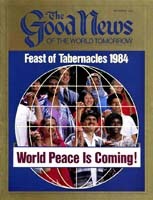 For many reading this, "Now is the accepted time; behold, now is the day of salvation" (II Corinthians 6:2). "For the time has come for judgment to begin at the house of God" (I Peter 4:17). If you are an average person and you were informed that you could receive an unlimited amount of money — billions of dollars — the exact amount depending on how well you learned, let us say, Spanish in two months time, you would embark on the most intense crash-learning program of your life. You would study from early morning to late evening. You would listen to tapes of the spoken language even while taking care of daily, mundane duties. You would carry with you notes on cards to review during free moments. Your goal would constantly be on your mind. Worthless television programs would hold little interest. No other activities would be allowed to interfere. For the duration of your allotted time you would eat, sleep and breathe Spanish. Isn't learning about God of far greater importance? Should we not give it greater effort? Of course we should! Make every effort to drink in now of God's Word and His Spirit. They are free, unlimited and become in those who seek them out "a fountain of water springing up into everlasting life" (John 4:14). That is wisdom. If we are wise, if we number our days properly, we don't have to worry about the shortness of this life. We don't have to be anxious that our physical dwellings are temporary, that they become older and more decrepit with each passing day. God is our permanent dwelling (Psalm 90:1). He is our safe, unshakable habitation (Psalm 91). We have this assurance. For this, let us rejoice at the Feast of Tabernacles!